A rainy, October day inspired these bars. It was yesterday. I wanted something healthy, not too sweet, a snack, and different from regular ol’ oatmeal (which I love to have for breakfast every day in some fancy form) or peanut butter and jelly (which is just an old classic that I never tire of). So, I thought why not combine the two into a afternoon treat to have with tea! Now, typically, I don’t bake vegan, because I am a wholehearted believer that nothing is better than real butter. and real milk. and real eggs, and furthermore I don’t need to bake vegan, since I’m blessed with zero food allergies. But when you find yourself without butter, without eggs, and it’s pouring rain outside and you can’t find the strength to walk less than a half a mile to the corner store, you improvise. So vegan is my improvisation. And instead of walking to the store, I walked to my backyard to pick an avocado. Yes, that’s right, these have avocados in them. You may have noticed from previous posts that I have incorporated avocado in place of the fat (oil or butter). It’s a sneaky way to incorporate heart-healthy and cancer-fighting fats into your diet. 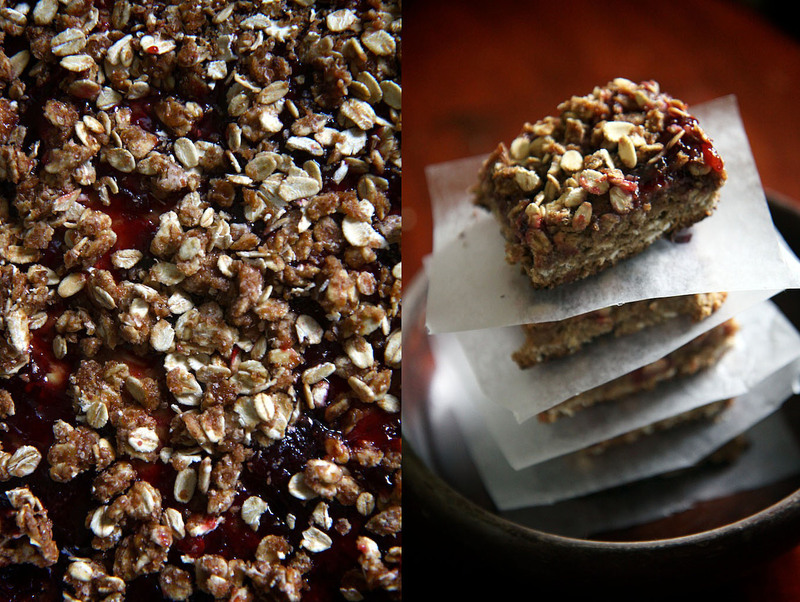 I used a german cherry jam in these bars, but any jam can clearly be used. Additionally, the peanut butter could be omitted for those who don’t like peanut butter. And of course with the streusel topping, feel free to be creative, adding any kind of nuts, seeds, or coconut. Combine the dry ingredients (first eight) in a large bowl. 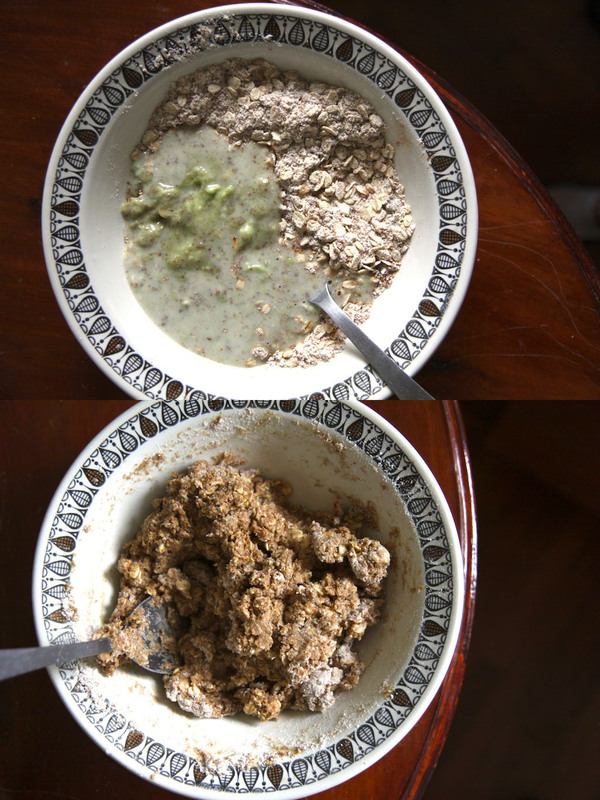 In a separate bowl, mix the flax egg with the mashed avocado, honey, vanilla, and almond milk. Stir well to combine. Add the wet mixture to the dry mixture. Stir to combine, gently. Should be the consistency of cookie dough. If too moist, add a little more flour. Pat the mixture into the bottom of a greased 8×8 square baking pan. Spread the peanut butter on top. In a small sauce pan, heat the jam with the juice of half a small orange and the rind. Boil down until mixture thickens a bit. 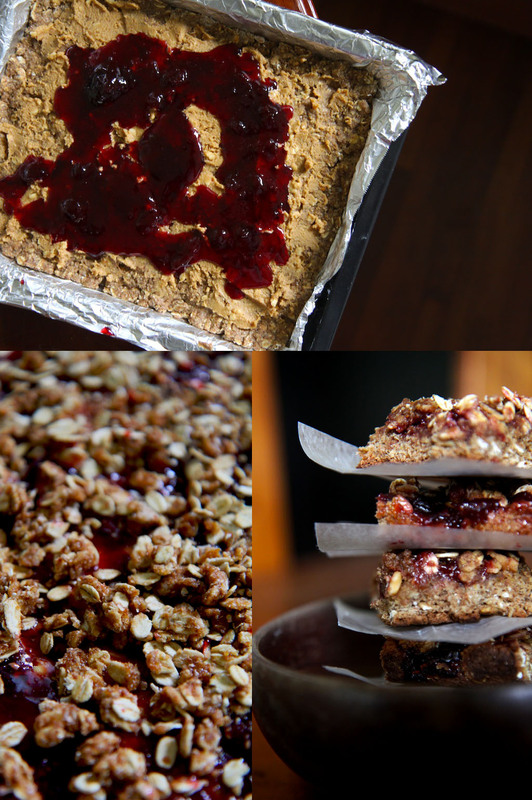 Spread the jam mixture over the oat bottom and the peanut butter. Mix the streusel topping. Sprinkle streusel over the bars and spread to even out. Bake in 350 oven for 25-30 minutes until jam is bubbly and streusel is golden brown. 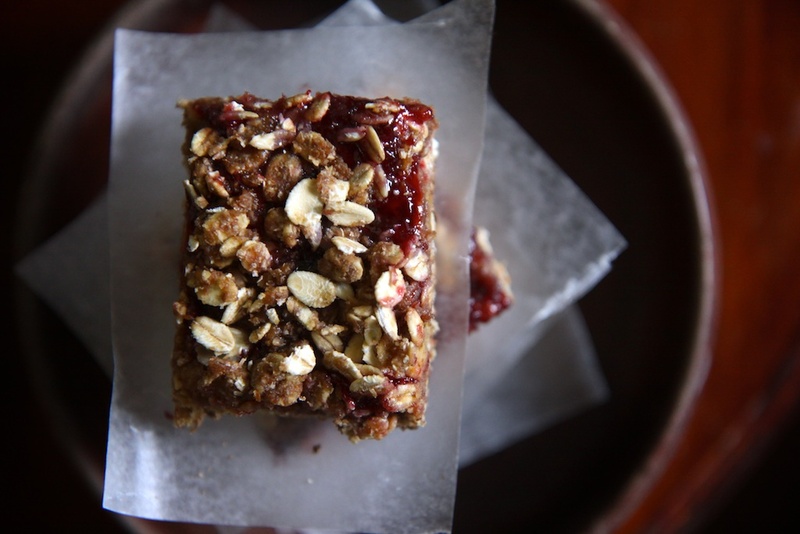 Cut into squares and enjoy with afternoon coffee or tea! These also freeze well.